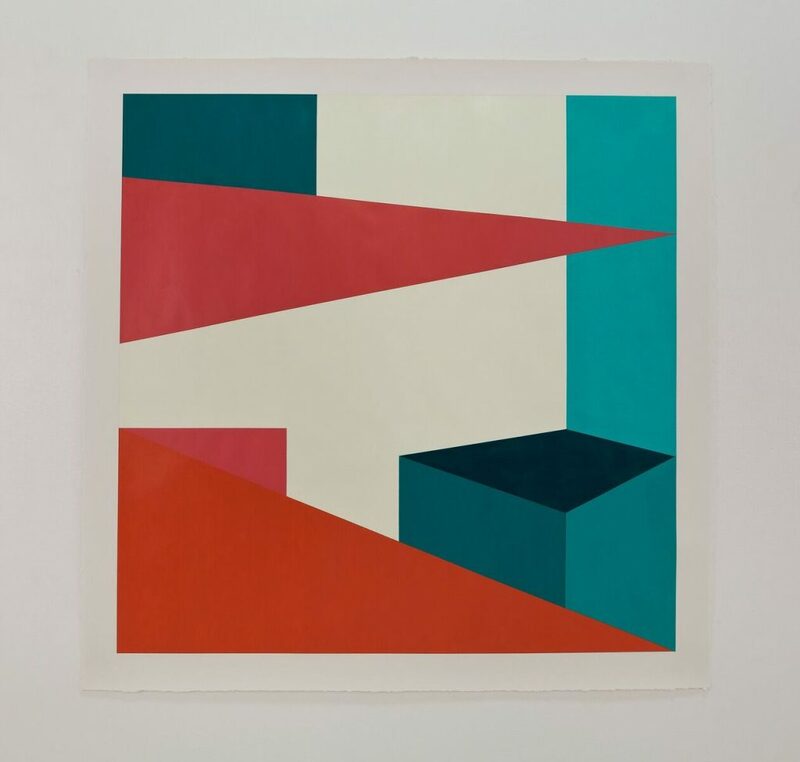 Long time Miami-based artist and teacher Karen Rifas was given a great luxury in her new show Deceptive Constructions at The Bass in Miami Beach. She had the large high-ceilinged exhibition space room available to her in advance, so she could literally plan the show within and around (and up and down) it. 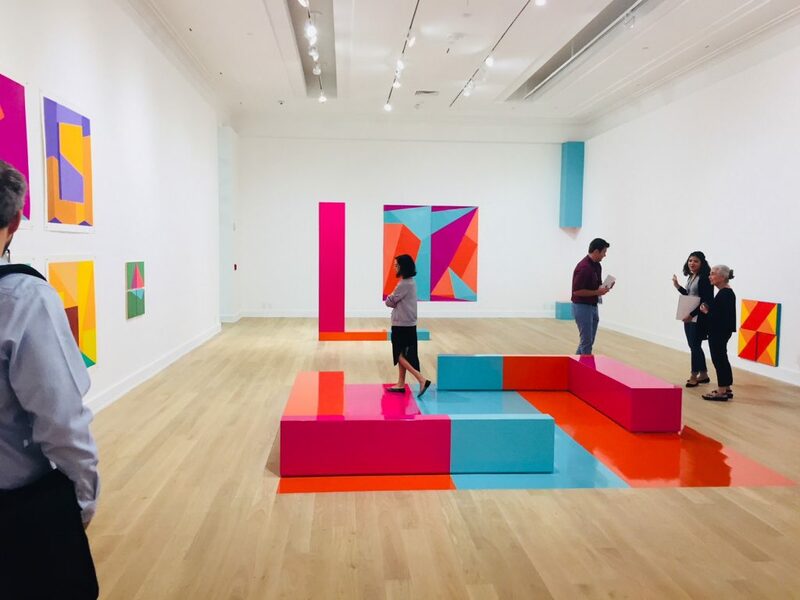 The result is a joyous contained geometric exploration of color in materials and shapes as diverse as paint, vinyl, paper, and three-dimensional sculptural boxes and benches and rugs. The colors are juicily non-primary with teal blue, blood orange, hibiscus pink, lilac lavender and sunset red popping on the walls and floors. The geometric lines and converging shapes look both achingly familiar and startlingly new. The references from exotic textile patterns – think African and Native American, and Art Deco frieze geometrics – particularly on a long rectangular shaped work flush up to the ceiling in lime green and purple, keep the eye moving and the brain thinking. Many of the larger works are new on paper with raw edges, a good decision that frees the works of the confines of glass and framing to let those alive colors breathe. Some are sectioned like windowpane views, while others begin to have a narrative feel of a street corner or Cubist vision. This is art that Rifas wants viewers to be enveloped by, so she lays it out in vinyl “rugs” on the floor one can walk on and sculptural benches that can be sat on and rearranged. These cozy vibrant seating installations match the colors of the new wall works, reorienting what is “art” and what is “installation” and even what could be “décor.” The slick shiny vinyl makes it pop and keeps the colors looking clean and bright. An L-shaped work beyond the seating area is purely sculptural and lines up with the diagonals of the room and then the large artwork on the wall beyond it. In the corner is a broken totem of sorts, with a teal-shaped cube on the floor separated from the rest of it by several feet of empty space. The looming teal rectangle/box/sculpture above runs up to the ceiling, the empty space in between makes a third shape, offering a shelter, a nook, a glamorous or perhaps dangerous place to be. Or both. A contrasting cube in pink and orange sits in the opposite corner of the room, patiently awaiting visual connection. All the works have numbers rather than names, whether they are signifying a series or dates is unclear, but adds to the unnameable mystique. This is Rifas’ first solo museum exhibition in over 10 years and you can tell she had fun playing with the malleability of perception. She’s been working this territory for a long time, playing with lines in space by threading leaves or string across rooms and space. This creates shapes both inner and outer, art that is Pop and Op. It’s particularly suited to Miami, where the light, flora, and architecture sings in these rich, tropic colors year round. She has created similar installations at her longtime gallery Emerson Dorsch, but the height and light and sheer uninterrupted clean, clear space at The Bass givers her real breathing room. She has also had shows at Meeting House Gallery (2016), MDC Museum of Art + Design (2015), De La Cruz Collection (2010), Pinnacle Gallery, Savannah College of Art and Design (2007), Polk Museum of Art (2004), and Museo De Arte Comtemporaneo, Panama City (1993) among others. She is a constant, smiling presence at others artists exhibitions and events, supporting and encouraging and learning all at once. 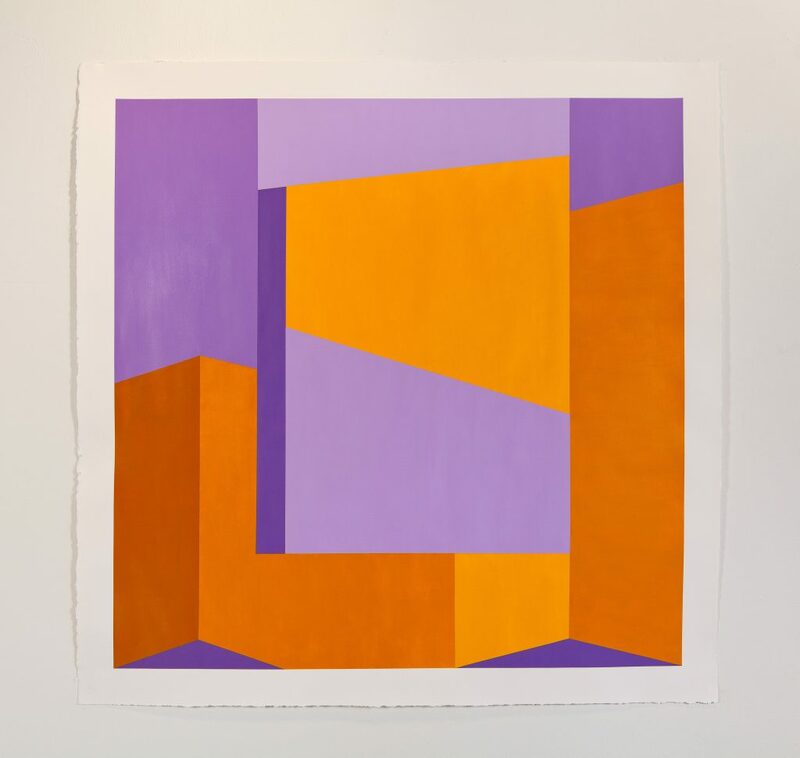 She was in a large South Florida artist survey I helped with called 100+ Degrees in the Shade: A Survey of South Florida Art (2015) in the Design District in Miami at a 4,000-square-foot pop-up space. It’s a joy to see her given such a luxurious, lively summer show at the newly renovated Bass. Her exhibit is right off the new lobby and next to the café and enclosed sculpture room, a generous gift to one of Miami’s own. 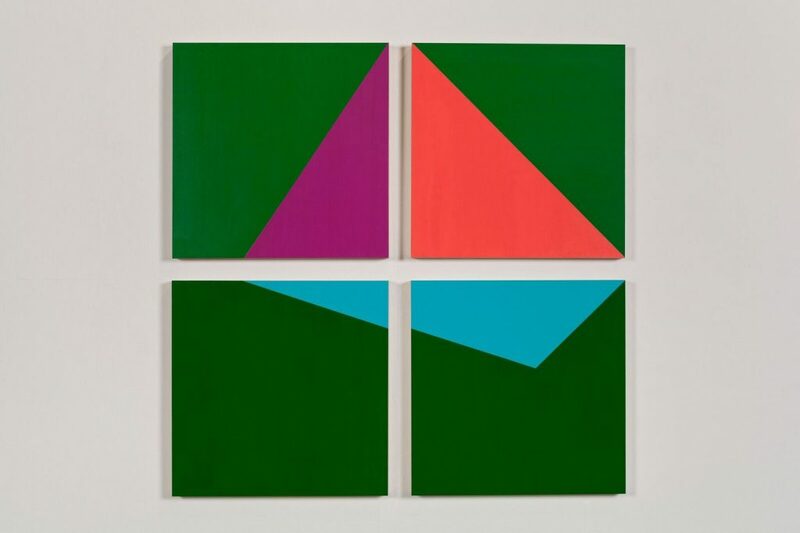 Karen Rifas: Deceptive Constructions runs at The Bass Museum of Art, 2100 Collins Ave., Miami Beach, through Oct. 21. Hours are 10 a.m. through 5 p.m. Wednesday through Sunday. General admission is $10. Call 305-673-7530 or visit thebass.org for more information.